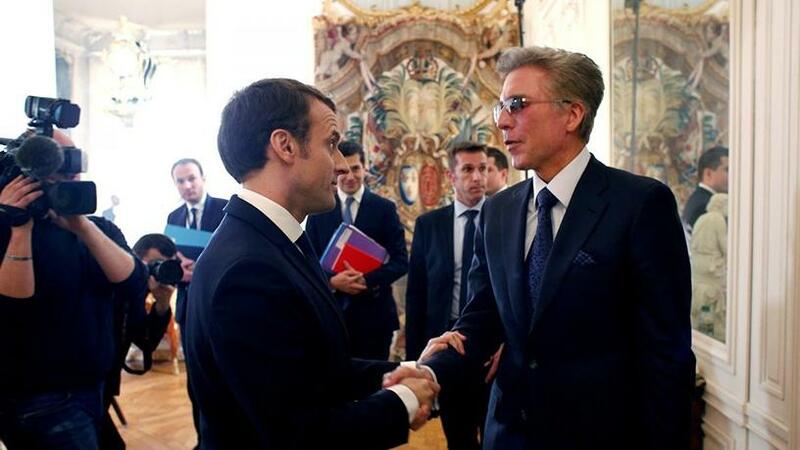 French president Emmanuel Macron with Bill McDermott, CEO of SAP. SAP is unveiling its biggest product makeover in years, rolling up its sales, marketing and customer service software into a single suite of tools that it says will offer greater privacy safeguards, taking aim at faster-growing rivals like Salesforce. SAP, the world leader in "back-office" financial control systems, yesterday made its long-anticipated move to bring together all its "front office" software, combining a dozen separate customer-facing products and recent acquisitions, into a single integrated offering to be known as C/4HANA. SAP executives said classic sales-prospecting software is ready to be disrupted by a more joined-up approach that deeply connects sales and marketing functions with data from SAP's "back office" planning tools to form a single software suite. The new software covers not only sales and marketing functions but also commerce, customer service and consumer data protection tools, which SAP sees as a weakness in older, largely sales-focused platforms as new European data rules take effect. "Today, customers are rebelling against being treated as sales opportunities," Alex Atzberger, president for customer software, said during a speech laying out SAP's new product strategy at its annual Sapphire user conference in Orlando. "They don't want any e-mails they didn't ask for," Atzberger said. "Customers are done with creepy. Without [customer consent], don't personalise," he told an audience of software sales pros. Customer relationship management (CRM) tools have surged to become the biggest category of business software, Gartner research shows. As such, CRM has become a market too big for SAP to ignore, Barclays financial analysts said. SAP is seeking to capitalise on rising consumer privacy fears as tough new rules kick in with Europe's General Data Protection Regulation, which took effect in May and threatens stiff penalties for firms that fail to keep up. US-based Salesforce is the CRM leader with around 20% of the global market, more than twice SAP's share, while rival Oracle is number three, according to 2016 data from market research firm Gartner. They were closely followed by fast-growing competitors Adobe and Microsoft. To step up its game, Germany-based SAP said on Tuesday it had acquired CoreSystems, a Swiss firm specialising in customer service software, on undisclosed terms. It's the latest in a string of related deals including Callidus, Hybris and Gigya. CoreSystems helps manufacturing, energy, high-tech and telecom firms to "crowd source" their field service operations, allowing them to cut response times by field service technicians or contractors for new installations or maintenance calls, reducing the time customers are left waiting at home. Front-office CRM software has already overtaken back-office enterprise resource planning (ERP) tools, where SAP is dominant. CRM will top database management software in 2018 to become the biggest single category of business software, Gartner predicts. There are thousands of CRM apps, with more being released every month, making it critical that SAP's all-in-one-suite approach still allows customers room to tap the wider system of innovation that is constantly redefining what businesses can expect CRM software to do to help them win and keep customers. Gartner analyst Ed Thompson said SAP must show it can work with this constantly evolving ecosystem, the way Salesforce, Microsoft, Oracle, Adobe and Pegasystems have done by creating marketplaces of apps to plug into their own platforms. SAP must still convince users it can deliver on chief executive Bill McDermott's repeated boasts that it "has quietly been working on a master plan to disrupt CRM" and "SAP is focused on CRM big time". It provided a detailed technology roadmap at Sapphire for the steps it will take through the end of 2019 to fully deliver on its C/4HANA promises, seeking to address concerns over SAP's patchwork approach to its existing front-office software. The brokerage argues the full customer suite, when ready next year, could set in motion major upgrades by some of SAP's biggest customers, which could sustain growth in coming years.